“Songwriters write and sing their songs because they just have to”. If they’re gifted, guided and lucky, they know it when they’re young and they pursue it as a career, as a life mission. Like Ginny Mitchell did. Today she’s among the premier all time women musicians and singers from that creative arts haven that is Santa Cruz, on California’s alluring Central Coast. Ginny Mitchell was born in Berkeley and lived in Orinda until the deaths of both parents, a few months apart from each other. From Orinda she moved to Santa Cruz to live with Family. Ginny had always sung, in church choirs and at school, and took up the guitar around the age of 13. 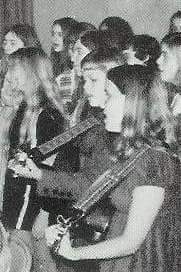 She attended Santa Cruz High School, studying music with beloved teacher Bill Wright. There she became friends with classmate and budding guitarist Steve Palazzo, who she taught how to play a D chord. Steve has gone on to become a well-respected bluegrass flatpicker and fingerstyle player with recordings of his own and with bluegrass band Homefire. After high school Ginny studied music at Cabrillo College, taking Ray Brown’s legendary jazz improv class. She became the first vocalist to finish the class and she went on to receive her Associate of Arts degree in music at Cabrillo. She continued her musical studies at UCSC. She then married and moved to Canada, taking up residence in the town of Malakwa, British Columbia. While living there Ginny and her husband Tim started a concert production company called Starlite Productions. She began to make a name for herself as a singer, and in 1986 was given the Best New Artist award by the Canadian Country Music Association. She was also nominated for a Juno award, which is the Canadian version of our Grammy. After a few years Ginny and Tim moved back to the Santa Cruz area. She formed a band with Canadian country guitarist Redd Volkaert, who she had met in Canada and has become one of the most respected guitarists in the world. Around this time the marriage broke up. As part of the healing process she became involved with Sean Seman’s Young at Heart, singing for the elderly residents of convalescent homes, and joined the Mt.Madonna Choir. Destiny stepped in when she happened to meet a filmmaker named Marty Collins, who became the director for her “Wild Rose” music video. At the time he had a production company in San Jose called, of all things, Starlite Productions. They married in 2001. Ginny’s friend, singer Lacy J. Dalton, did a cameo on the video as a waitress. The next year it won an award from IUMA and TechTV. In the late 1990s Ginny and Marty went to Virginia City, Nevada to film Lacy’s “Wild Horse Crossing” CD release concert. Ginny had done some harmony singing on the recording and was aware of Lacy’s efforts to save a herd of wild horses near her Virginia City home. While visiting they learned more about the dire situation of the wild horses of Storey County and the idea for a documentary was born. Out of this idea came the Girls from Santa Cruz concert, which was presented and video taped at the Santa Cruz High School auditorium in June of 2002. A Girls From Santa Cruz CD and DVD, with footage of the wild horses and interviews, followed. This PBS special continues to raise money for the cause. Ginny Mitchell most recent CD is titled “Just to Hear Your Voice”. It was Co-produced by Ginny and drummer Jim Norris, this CD features two of her originals, “Miss You Boy” and the lovely “Ed and Alice”. The rest of the songs are covers of favorites. Featured are her stunning versions of Don Henley’s “Heart of the Matter” and the Rolling Stones’ “Mother’s Little Helper”, the latter done in a full-on Bluegrass arrangement. Also included are soft jazz versions of “When You Wish Upon a Star” and “Stardust”, along with some country / rock, Americana, folk and a gospel selection. Of these “Shine”, “Straight to You” and “Sanctuary” stand out.